AuraVR Pro is a high quality vr headset 360 degree viewer device from the pioneers of Virtual Reality - AuraVR. It is used for enjoying VR Games, Videos, 3D Movies, Photosphere images & VR content on your mobile phone. In this Pro series VR gear, we have included all the valuable feedback received from customers. It can support smart phones with varied sizes ranging from 3.5"-6". Its perfect design and quality material does not allow any light to seep in for immersive viewing. We all have different face structures, some have round while others may have oval or oblong so this vr headset fits them all . Because of IPD - Inter Pupillary Distance controller and distance adjuster, lenses can be adjusted according to individual eye sight and face structure. The AuraVR Pro virtual reality gear is inspired by Google Cardboard and certain features of Oculus rift. It offers superior durability and tech specifications compared to other VR headsets. Features include - Visual Display Features: -Adjust Interpupillary distance to match facial shape - Large field of view - Adjustable screen to lens distance - Can be used by people who wear glasses - Adjust for every head size via quality Velcro strap - Soft leather cushion in front that covers face - Leather band for soft back of the head support - Quality plastic used with soft edges - Very comfortable around the nose Additional Details: - Comes with Quality Cardboard Box Packaging and user guide. 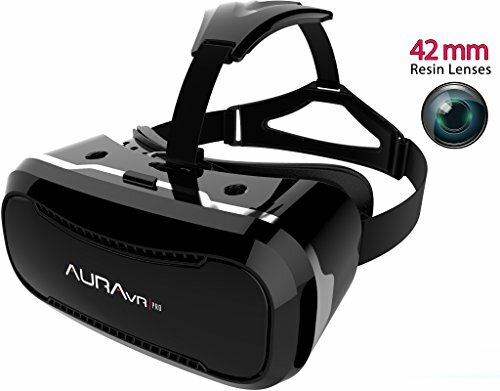 AuraVR Pro VR Headset is made from finest quality plastic making it more durable and light in weight. This design is a successful result of indepth research, industry experience and customer feedbacks. It is inspired from Google Cardboard, Oculus Rift & Gear VR. It can support smart phones with varied sizes ranging from 3.5"-6" and can be used with spectacles. UNIQUE FEATURES - AuraVR Pro allows you to adjust the Inter Pupillary Distance & the distance between the lens and the screen for better focus. Both the lenses can be adjusted independently and INDIVIDUALLY which is a UNIQUE and added feature in this headset. Also it uses One Finger Phone Insertion Mechanism thus making it easier to insert your phone and thus easy immersive viewing experience. IMPROVED DESIGN & QUALITY - If your smart phone gets heated during the longer usage hours, then this VR box comes with removable front lid AND AIR VENTS for easy heat dissipation. Lenses are the most important part of the VR headset and here we are using improved nano coated optical resin 42 mm lenses and 100-110 FOV. It also comes with best in class adjustable head strap, head mount and back of head cushion support. COMPATIBILITY - Mobile phones running with operating system as android 4.1 and above or iOS 5 and above. For utilizing complete functionality of VR headset, phone must have sensors like Gyro sensor,proximity sensor & magnetometer..AuraVR Pro VR headset is brought to you by the pioneers of Virtual Reality in India. We believe in providing best value for money through quality products & after sales services. If you have any questions about this product by AuraVR, contact us by completing and submitting the form below. If you are looking for a specif part number, please include it with your message.